In this paper, we single out one of the problem aspects of multimedia: how can one efficiently store high-quality picture information in a manner that does not make its retrieval characteristics incompatible with the needs of a (distributed) multimedia application. These needs include: timely access to data, predictable access to common (i.e., network) resources and ease in user specification of information. Our approach to solving this problem is to define adaptive data objects that adjust the amount and type of information given to an application as a function of resource availability. The key to our approach is that we transparently adapt the information presented to the application based on a set of pre-specified conditions that were defined by the application at author time. We discuss this work in the context of a parallel JPEG image decoder that provides adaptive images (with respect to data content and image representation) based on a transparent client/server negotiation scheme. Our work is based on the Amsterdam Multimedia Framework (AMF), a partitioning of control operations for supporting distributed multimedia. The parallel JPEG algorithm, AMF and the negotiated control algorithm are explained. Bulterman, D.C.A, & Winter, D.T. (1993). 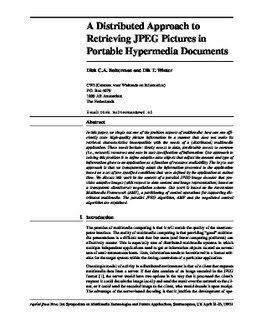 A distributed approach to retrieving JPEG pictures in portable hypermedia documents. In R.I Damper, W Hall, & J.W Richards (Eds. ), Proceedings of IEEE International Symposium on Multimedia Technologies and Future Applications 1993. IEEE.